During This Holy Day Season I have aquired some lovely items. Some I have purchased from some of you and some are gifts of friendship. 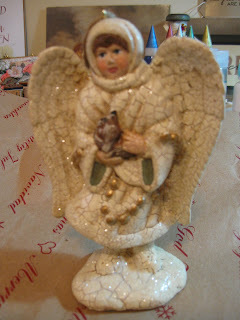 This lovely Angel figurine was given to me from my friend Mary Pernula. This lovely Angel I bought from Dorthe in Denmark. She also made this beautiful tag and tinsel star for me. Thank you Dorthe!! This lovely embroidered Angel and Manger ornament was made by my friend Hero one of my Georgia blogging buddies. Isn't it gorgeous?